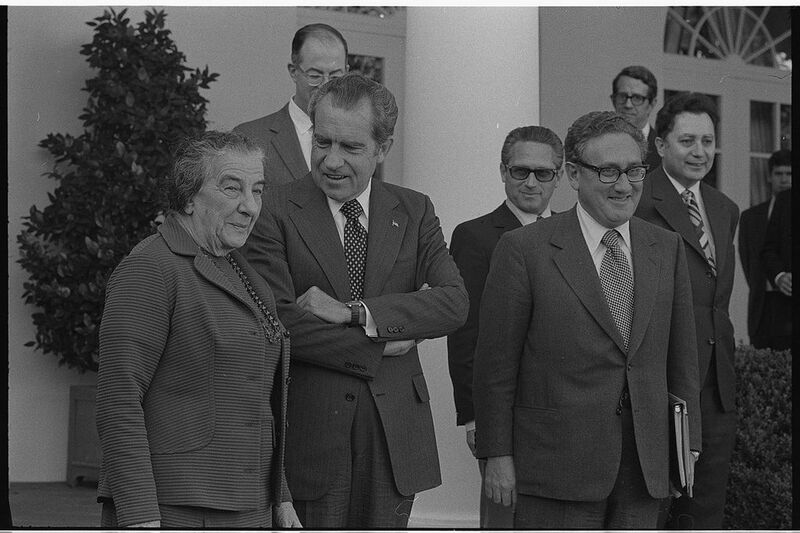 By the time this photo of Israeli Prime Minister Golda Meir standing with president Richard Nixon and Henry Kissinger, outside the White House was taken in 1973, she'd been dealing with her illness for years. Golda Meir, Israel's first and only female prime minister, once was voted the most admired woman in America. Her life took her from Ukraine to Milwaukee to Palestine before she fought for Israel's autonomy, signed its declaration of independence, and led it through tumultuous times. Her power was so legendary that the American feminist movement in 1970 used her image on a poster bearing the caption, "But Can She Type?," swiping at sexist assumptions that used to send women with all kinds of qualifications to work in the typing pool. But behind that image of strength was a woman with serious health problems, which she worked hard to conceal, trying to save her new nation from additional worries. Meir was born Goldie Mabovitch in Kiev, present-day Ukraine, on May 3, 1898. She emigrated as a child with her mother and two sisters in 1906 from pogrom-torn Pinsk, Ukraine, to meet her father, who was by then a storekeeper in Milwaukee. As a teen, she became a Zionist, and graduated from teachers college at what is now the University of Wisconsin-Milwaukee. She married Morris Meyerson, a committed socialist, and the couple quit their jobs to move to a kibbutz in Palestine in 1921. She thrived on the hard farm work of kibbutz life, and her leadership skills soon became clear. Starting as a kibbutz leader, Meir rose swiftly. By 1938, she was the Jewish observer from Palestine at the conference called by President Franklin Roosevelt to consider the fate of Jews fleeing the Nazis. To her despair, most nations expressed only sympathy, rather than admitting refugees. Later, she told reporters, "There is only one thing I hope to see before I die and that is that my people should not need expressions of sympathy anymore." After Israel's 1948 War of Independence, Meir became a member of the Knesset, the nation's legislature. She then served as minister of labor (1949-1956) and then foreign minister in 1956 under prime minister David Ben-Gurion. Asked to adopt a Hebrew surname, she chose Meir, which means "illuminator." In March 1969, after Prime Minister Levi Eshkol died in office, Meir was chosen to take his place temporarily. Later that year, she was elected Israel's first female prime minister, leading a coalition party. She remained in office until she resigned on June 3, 1974. But her health had started to fail her years before then. She had lost consciousness at least twice while serving in the foreign ministry, once during a daylong political party meeting in Israel, and again during a bus journey in southern Africa. She even retired temporarily in 1966, citing ill health and exhaustion. By the time she resigned as prime minister, she had served more than four years despite a continuing and lingering secret illness. She felt progressively weaker, and kept midnight appointments at Israel's Hadassah Hospital, where a white blood cell abnormality was uncovered. What was wrong with Meir, and why was she so secretive about her condition? Golda Meir led her young nation through years of turmoil. In 1972, at the Munich Olympics, 11 Israeli Olympic team members taken hostage and killed. Then came the Yom Kippur War, which Meir described as her greatest crisis, when Egypt and Syria attacked and almost defeated Israel in October 1973. Many critics said that Meir's and Israel's defenses were caught sleeping on the Day of Atonement, the holiest day on the Jewish calendar. Still, her party won the next election. But on April 10, 1974, Meir retired, stating, "It is beyond my strength to continue carrying this burden." Four years later, in 1978, she died in Jerusalem's Hadassah Hospital at the age of 80. For 15 years, she and her staff had concealed that she suffered from lymphoma, a cancer that starts in the body's infection-fighting white blood cells, known as lymphocytes. Symptoms and signs of lymphoma include swollen glands (lymph nodes), anemia, neutropenia (low white blood cell count), fatigue, weakness, gastrointestinal symptoms, weight loss, nausea, vomiting, diarrhea, neurological numbness, and even heart failure. Lymphoma is divided into two categories: Hodgkin Lymphoma, which is one of the most treatable cancers, and non-Hodgkin Lymphoma, a diverse group of diseases, some of which are slow growing. Modern treatment options for lymphoma include radiation, chemotherapy, immunotherapy, and stem cell transplants.